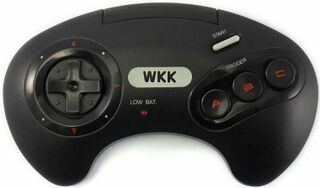 The Remote Control System is a third party accessory for both the Sega Master System and Sega Mega Drive, similar in nature to the Remote Arcade System. It acts as a wireless alternative to the standard control pads, with infra-red controllers and receivers. Unlike the Remote Arcade System, the Remote Control System's control pads have an LED signaling low battery life. Both Master System and Mega Drive-branded units were released, but it seems both are identical, save for a different label on the receiver (and the button on the Master System version does not function). It is presumed the controllers are compatible with both receivers and receivers compatible with both consoles. The Mega Drive package shipped with two controllers, while the Master System only contains one, explaining the differences in price. A possible successor known known as the Cordless Elite was advertised with turbo features in North America. A non-functional prototype has been spotted, but now lies in the hands of private collectors. Main article: Remote Control System/Magazine articles.